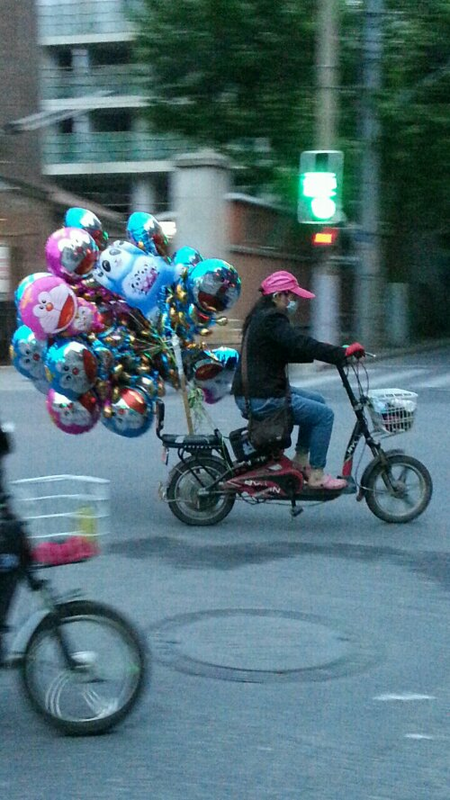 Balloon bikes may be my favorite kind of bikes on the roads of Shanghai, but don’t let their cuteness fool you… These people are wacky drivers (even by Chinese standards), and I have photographic evidence to substantiate this claim. If you look in the background of the picture above you’ll see that this balloon bike is crossing the street illegally, but that’s OK cause these bikes are magical and most likely also invincible. And they can fly. OK ya no none of that’s true (beside the wacky driver part). But if they ever get hit because they are crossing the street illegally (and most likely with compromised vision) then at least they have some cushioning. But I hope they don’t ever get hit so they can continue spreading joy all over Shanghai!